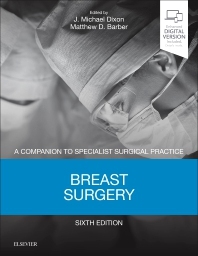 Breast Surgery meets the needs of surgeons in higher training and practising consultants for a contemporary and evidence-based account of this sub-specialty that is relevant to their general surgical practice. It is a practical reference source incorporating the most current information on recent developments, management issues and operative procedures. The text is thoroughly referenced and supported by evidence-based recommendations wherever possible, distinguishing between strong evidence to support a conclusion, and evidence suggesting that a recommendation can be reached on the balance of probabilities.